In April, 2005, Sam and Debryn Webster took possession of a '37 Halberg Rassy sailboat with the intent of becoming a sailing family. They plan to try it for five months initially, and then decide whether to do it full time, or just part of each year. 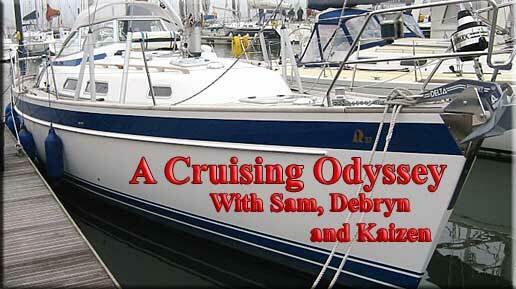 This series will follow their transition to the nautical life with their three year old son, Kaizen. I'm back from the Channel Islands. We (Bryan the instructor and myself) had a great trip. Came somewhat close to getting run over by a massive tanker, but MARPA on the radar notified me we were on a collision course and by the time I got Bryan up to confirm (dead of night so could only see lights bearing down on us and could see both starboard green and port red lights indicating the ship was headed straight for us...) the tanker had begun to alter course as she obviously had determined we were on a collision course as well! We did have right-of-way as we were under sail. Other than that saw a lot of ships and passed them within a half mile or so but nothing really uncomfortable like the first incident. Bryan put me on watch through the shipping channel both going (night) and coming back (daytime) so I could get experience. He then went below to sleep... How he could sleep knowing there was someone on watch who had never done this sort of thing before I don't know - must have nerves of steel. 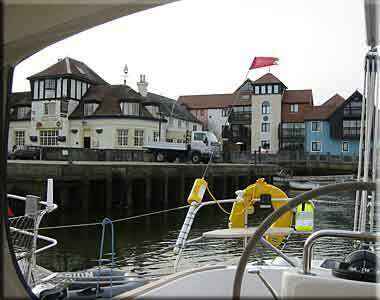 Our schedule was a follows: Sailed from Hamble, England to Guernsey in the Channel Islands the first day (15hrs). Second day finished the paperwork to complete the sale in the Channel Islands as there is no Value Added Tax (17.5%) there. 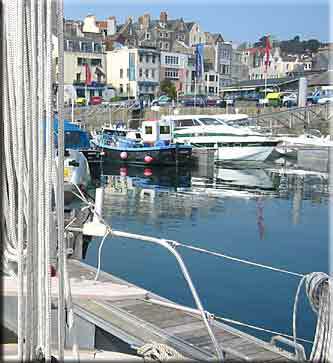 Third day sailed to Alderney (also in the Channel Islands). Fourth Day ran back to England threading our way through the Needles at night to get back into the Solent (strip of water between the Isle of Wight and England). Fifth day played around in a Force Nine strong gale in the Solent. (Excellent training to see what a gale is like when sailing! Debryn Ruth - our 2004 Hallberg Rassy 37 - performed flawlessly!) Sixth day sailed to Cowes where Ellen (the woman who just broke the world record for fastest solo time around the world) berths her boat. We saw a lot of the Fastnet/Whitbread race boats including Ecover which I believe got second in the last around the world race, but didn't actually see B&Q - her boat. 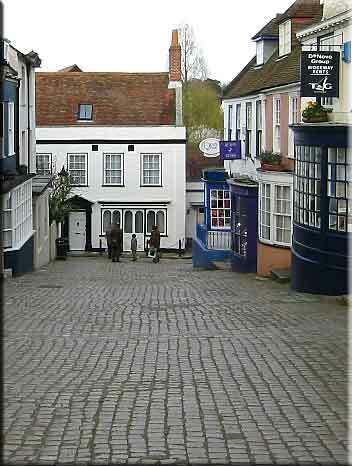 Yesterday we sailed to Lymington a very quaint little town on the Southern coast of England and finished the skill testing for my Coastal Skipper certificate. I'll pick up my certificate when I return, but can't sit the Yachtmaster exam until I have 2,500 miles of ocean sailing under my belt... (Yachtmaster is the highest level of certification the Royal Yachting Association offers.) Today, I'm talking to ship wrights, riggers and mechanics to get a few things added to the boat before we sail this summer. All in all a great week. Learned a lot. Saw a lot of picturesque places and had a lot of fun sailing. Map of English Channel Star is at Honfleur. Fecamp is just north. Map is interactive so you can move in, out and around. Map of Brittany Centered on Saint Malo, France. Map is interactive.